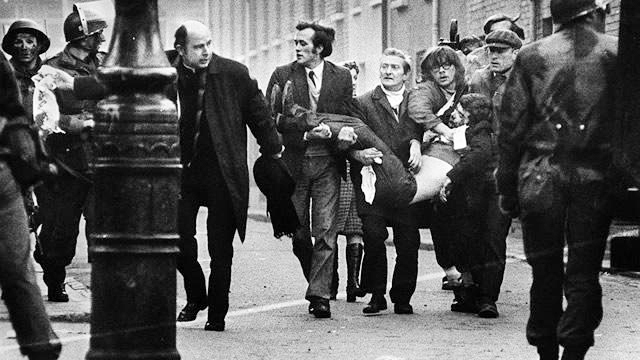 AN ex-Lance Corporal in the Parachute Regiment has been arrested in what police are calling a “new phase” in their investigation into the shooting dead of 14 innocent civilians on Bloody Sunday. The man, aged 66, was arrested yesterday in County Antrim and is being questioned at an unidentified police station in Belfast. Detectives from the PSNI’s Legacy Branch made the arrests as part of their inquiries into the January 1972 slaughter. The former soldier, who was a member of the Anti-Tank Platoon of the 1st Battalion, the Parachute Regiment, was identified as Lance Corporal J in the Saville Inquiry, and it’s thought he’s being questioned about evidence he gave to Saville about events around the ‘Rubble Barricade’ in Rossville Street. Detective Chief Superintendent Ian Harrison, who’s leading the investigation, said the arrest is the start of a “new phase in the overall investigation, which was launched in 2012, two years after the publication of the Saville Report which cleared the names of the men who died and led to an apology from British Prime Minister David Cameron. DCS Harrison added that the current investigation is set to continue for “some time”. He said in September that he wants to interview seven former soldiers in connection with the Bloody Sunday killings. Peter Madden of Madden and Finucane Solicitors, the firm representing most the families, said after news of the arrest broke: “This is a very welcome development. Following the publication of the Saville Report we made extensive submissions to the Police and Public Prosecution Service concerning the overwhelming evidence of joint enterprise between Soldiers P and J in relation to the murders of John Young and Michael McDaid. In the event that criminal charges follow, those charged must face public trial and will lose their anonymity”. Derry SDLP Councillor and member of the Bloody Sunday Trust, Brian Tierney, said he hopes the arrest will mark a “step change” in the police investigation. “I want to welcome the progress made in the investigation into the murder of 14 innocent civilians in Derry on Bloody Sunday,” he said. “The families of those murdered by British soldiers on that day in 1972 waited far too long for the truth about what happened, they should not be forced to wait any longer for justice. “The investigation into this atrocity committed against the people of Derry must now advance in earnest. I hope that today’s arrest is an indication of a step change in the process and that we will see more progress in the time ahead. Derry Sinn Fein MLA Raymond McCartney urged police to keep the Bloody Sunday families informed about developments. “I would call on the PSNI to ensure the relatives are kept up to date of all developments on the investigations,” he said. DUP East Londonderry MP Gregory Campbell demanded to know whether non-military personnel will be arrested as part of the Bloody Sunday investigation. “It remains to be seen whether the current investigations will focus solely on the actions of soldiers on that day or whether progress will be made on arresting others who were engaged in illegal terrorist activity at the same time,” he said.